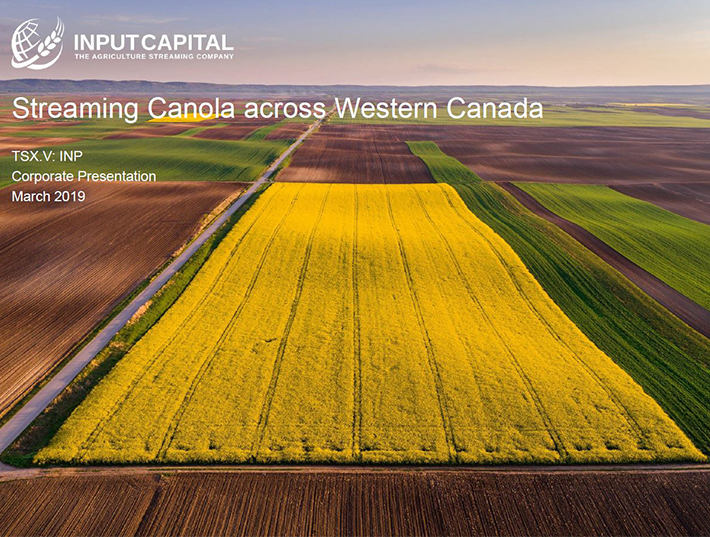 REGINA, Dec. 11, 2017 /CNW/ - Input Capital Corp. ("Input") (TSX Venture: INP) (US: INPCF) announced today the TSV Venture Exchange has accepted Input's application for a normal course issuer bid (the "Bid") for up to 6,578,683 of its common shares (the "Shares"), representing approximately 10% of Input's public float. As previously announced on December 6, 2017, the Bid will commence on December 14, 2017 and continue until the earlier of December 13, 2018 and the date by which Input has acquired the maximum Shares which may be purchased under the Bid. The Bid will be made through the facilities of the TSX Venture Exchange, or such other "designated exchange" as that term is defined by applicable Canadian securities laws, and the purchase and payment for the Shares will be made in accordance with TSX Venture Exchange requirements, or such other designated exchange, at the market price of the Shares at the time of acquisition. All Shares purchased by Input under the Bid will be cancelled. Input has appointed GMP Securities L.P. as its broker to conduct the Bid transactions.